My uniform is ironed, folded and ready for the anticipated call from my unit. After barrages of rockets from Gaza to Israel, it was time to retaliate. Many Israelis, who were getting tired of the situation, kept posting memes and updated their statuses expressing their wish to block rocket attacks and get back to normal life. It was at a certain point that the government decided to strike back, and has been doing so in surgical, pin-pointed airstrikes designed to stop the rockets by exploding them in mid-air as well as pounding at Hamas, its leadership and its infrastructure. On Facebook, you couldn’t help but notice the heartwarming gestures of people living in the central and northern parts of the country, offering their homes and sending warm wishes to the 1 million civilians within rocket range. But soon after, rockets started falling in central Israel, making it 5 million civilians under rocket range, exposed to physical danger as well as much frustration, confusion and anxiety. Israelis love Facebook so much that they forget there is a whole world out there which isn’t comprised of family and friends and who doesn’t necessarily support, understand or even know the slightest thing about what is happening now between Gaza and Israel. I noticed many of my friends, calling their friends and fans to post photos and testimonies of the rockets flying over their heads so that “the whole world will see”. 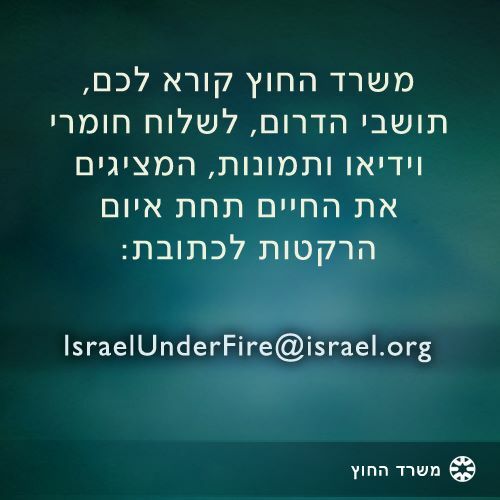 The Israeli Ministry of Foreign Affairs has asked civilians to email them videos and photos so that they may use them to create posters, memes and clips that will serve as advocacy materials in the public diplomacy efforts to keep the world informed and to maintain the first time ever general support of Israel and the opinion that Hamas launching daily, if not hourly rocket attacks from Gaza to Israel is the direct cause of this escalation. But you see, the conversation is on Twitter, not just on Facebook. If Facebook is a social network, then Twitter is a source of information to all, at any given time, on any topic. Israelis, as opposed to Palestinians, don’t use Twitter. And when it comes to Instagram, they seem to keep the tags very local. This simple truth leaves the 4th battle field totally neglected. 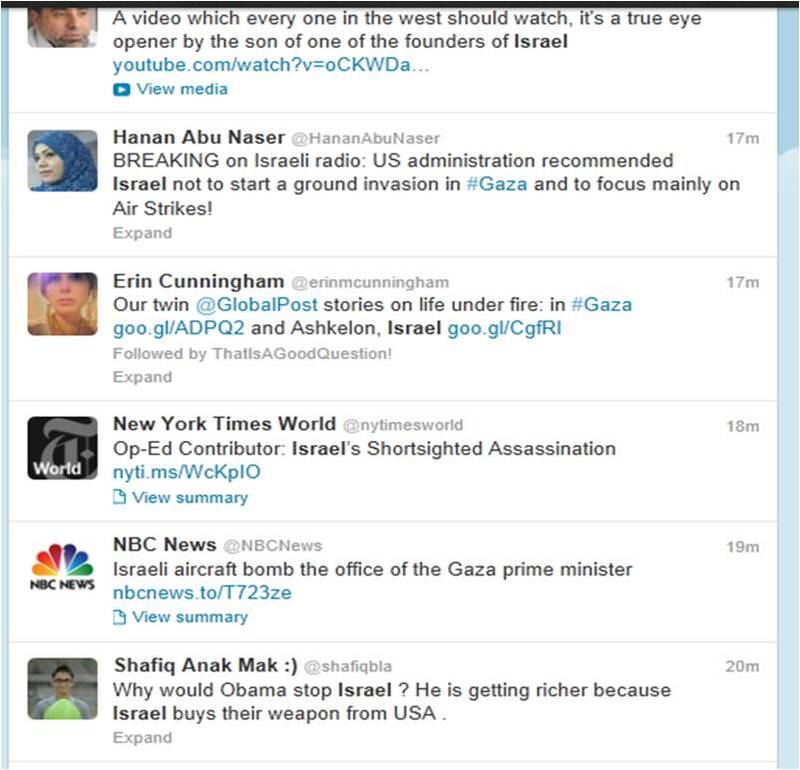 A quick scroll down the twitter feed using the tags #Israel or #Gaza will show exactly who is shaping and controlling the conversation. No matter how many advocacy groups and governemt organizations will try to contribute, it is the people, in this case the Palestinians who control the Twittersphere simply because it isn’t used by Israelis. Israel is the startup nation and the hub of technological innovation – Don’t ask them for photos, don’t create hashtags that no one searches for. Develop a simple, visual, location-based app that would enable people to share real-time alarms/sirens, rocket shells and of course photos and tags that will help them share their experience with everyone in the world, and not just their own circles. Once again, the best speakers and the people themselves, the moment you do it for them, you lose the ears and the hearts of your potential audience which is not yours, it’s in fact, theirs.